HONOLULU – A local educational nonprofit is seeking 8 to 12 high school students to be part of its upcoming Philippines study tour that will take place March 16-24, 2019. For more than 50 years, the Pacific & Asian Affairs Council (PAAC) has offered scholarships and opportunities for Hawaii high school students to travel and learn in the Asia Pacific region. PAAC also has taken students to the Philippines since October 2016, focusing on themes such as how Filipinos use grassroots empowerment to break the cycle of poverty. Study tour director Erica Nakanishi-Stanis sees the tour as an opportunity for students to take advantage of generous scholarships and experience the Philippines by visiting different nonprofits, businesses, and government agencies. “My job is to provide hands-on opportunities for students to go out and to get to know the world, get a feel for why the things they hear about in the news matter to them and their lives here and how they play a role in that. Inform, engage, and empower is the model I work on,” Nakanishi-Stanis shared explained. Throughout the study tour, Nakanishi-Stanis tries to ensure that students always consider multiple perspectives in history, politics, and society. In Intramuros and the U.S. embassy, for example, this means encouraging students to consider the impacts of colonialism to understand modern-day challenges in international relations and economics. “I don’t tell students this is the right version or wrong version of history, or this person is wrong because they have a different perspective. My job is to show them as many viewpoints and contexts as possible so they can think about it for themselves,” Nakanishi-Stanis added. The group will visit Tondo to learn how locals have fought for improved quality of life despite major disadvantages and challenges. The remainder of the week includes school visits to interact with other students, as well as visits to non-profits and other enterprises such as Gawad Kalinga and Bahay Tuluyan so that they can see the power of just one person to make a big difference. Each organization’s model offers a different solution to the problems that students will face as leaders in the future in Hawaii and the Philippines. Applying for the Philippines study tour is a simple process: three pages of simple questions about the person, one essay, a teacher recommendation and the student’s grades are all that are required to be considered. “We don’t reject students if they are not straight-A students. I am looking for students who have a genuine interest in the country we are going to and the themes of the trip,” Nakanishi-Stanis explained. PAAC also does not restrict students by grade in high school or whether or not they are of Filipino descent. “I find it’s better when you have a mixed group because you get totally different perspectives. The non-Filipino students have a chance to learn about this amazing, vibrant culture that doesn’t get featured enough in Hawaii,” Nakanishi-Stanis explained. “I had a student who had never gone to the Philippines before, and after coming back from he wrote in his journal – ‘I never understood my parents until now. I never understood where they came from and why they were the way they were, but after being on this trip, after seeing the Philippines with my own eyes, I get it,’” she recalled. In the last two years of the Philippines study tour, , over 80 percent of students received scholarships. The average scholarship package was $1,500 to $2,000, or a little more than half the cost of the program. PAAC also gives students time to fundraise for themselves and supports them in the process. “If you come from a family that doesn’t make a lot of money, don’t count yourself out. We always work with families to make the payments easier to handle. Our scholarships might not make it easy, but they can make it possible,” Nakanishi-Stanis stressed. 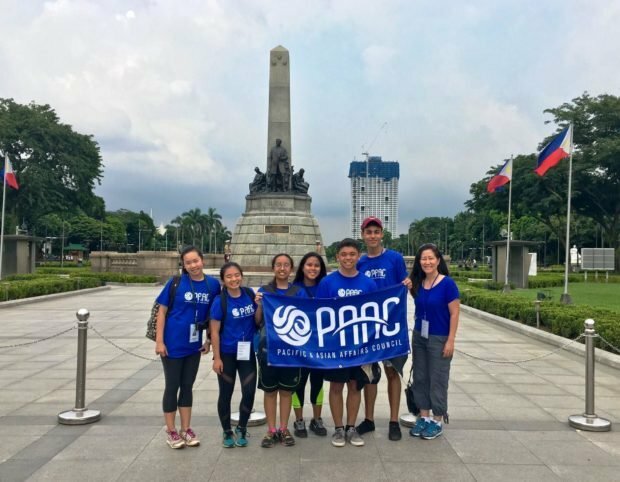 PAAC hopes that alumni of the program will come back and start to reflect in their actions and studies what they saw in the Philippines and get involved in their community and international affairs in meaningful ways. “I’m really hoping we see our youth grow and take the lead. Again, the goal is not to go and fix the Philippines. The goal is to learn from the Philippines and come back to build a better Hawaii. That is the ideal change we would like to see, for them to pay their knowledge forward,” she stated. Prospective applicants can get more information about the tour and apply at www.paacstudytours.org. Applications are due October 1, 2018 online or by post.